Come to our stand at Cosmofarma Exhibition and discover our products! Cosmofarma Exhibition is the reference event for all operators in the pharmaceutical sector and it will be held in Bologna, from 12th to 14th April. Participate at the scientific Breakfast MED of Phyto Garda during the Cosmofarma Exhibition. 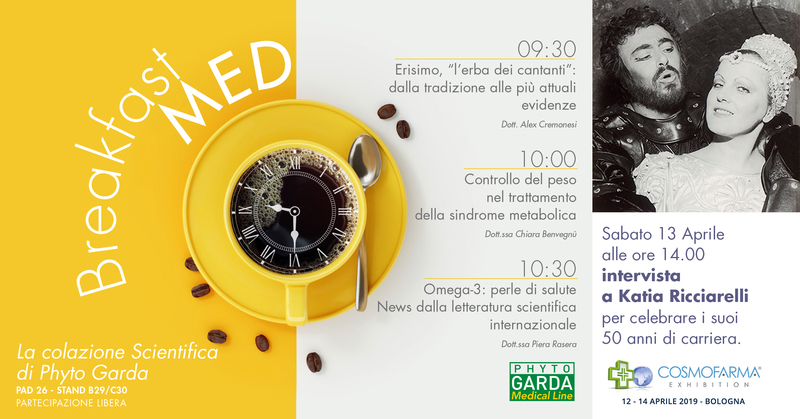 Every morning from 9.30 am, you can participate to breakfast MED at the Phyto Garda boots for scientific insights of our Scientific Division: from the Erisimo “the singers plant”, to the control of weight in the treatment of metabolic syndrome and to Omega-3, with news from the international scientific literature. And Saturday April 13th at 2:00 pm, a special interview with Katia Ricciarelli, to celebrate her 50-year career!